In its bid to give the black market a run for its money, Cannabis NB will introduce larger-format packages in the coming weeks — and it's working to lock in a more consistent supply. Cannabis NB can give New Brunswick's black market a run for its money, said CEO Brian Harriman — by introducing larger-format packages in the coming weeks and a more consistent product supply. 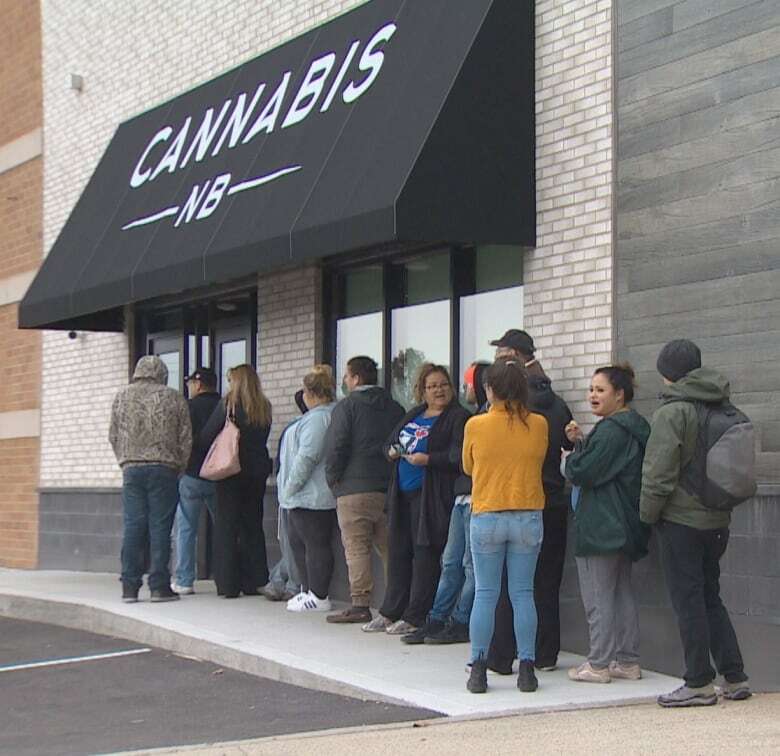 Despite concerns about higher pricing and product shortages, the retailer reported sales of nearly $945,000 within the first 48 hours of legalization. Fredericton's Cannabis NB location on Woodside Lane did a brisker business than any store in the province, moving $61,119 worth of product in the first 48 hours. By comparison, the Richibucto location saw just $26,826 in sales in the same two-day period. While some stores performed better than others, overall "the model seems to be resonating really well with consumers in New Brunswick," said Harriman. The provincial cannabis authority is "evolving" by introducing bulk pricing in the coming weeks, he said. A range of problems on the licensed producers' ends, Harriman said, also interrupted the flow of products to some locations across the province. Consumers have noted that Cannabis NB's prices seem unduly expensive compared with those in neighbouring Prince Edward Island and Nova Scotia — in some cases by a dollar more per gram. With prices for some strains as high as $15.50 for a single gram — second only to those in Northwest Territories — some have raised questions about how the government retailer will compete with dealers who sell a similar gram for as little as $5. "We're slightly premium to the black market," Harriman said. That could change, he said, when larger format containers of pot become available on Cannabis NB shelves in the coming weeks. Only one-gram, 3.5-gram and seven-gram containers were available on opening day, said Harriman. Bulk options were "supposed to be there on day one, but we've had some shortages in supply." The new larger sizes, while "not a promotional strategy," Harriman said, allow people who buy in larger quantities to take advantage of a "better price." 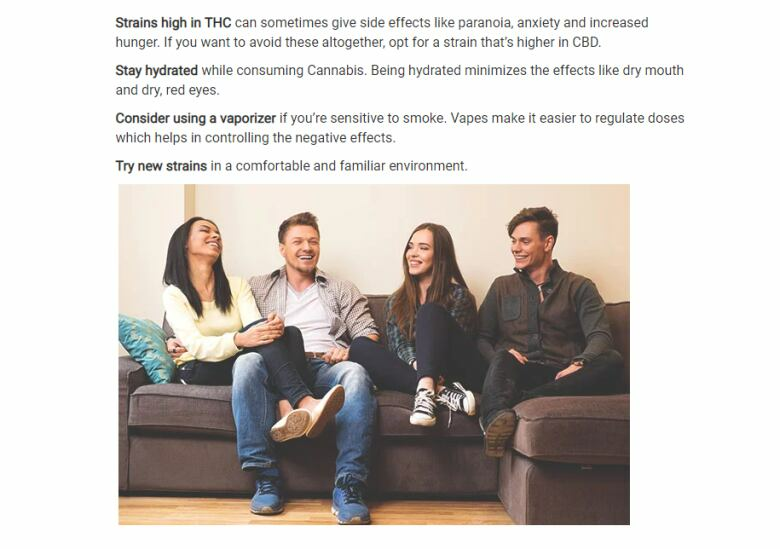 A screenshot from the Cannabis NB website showing a group of people. The website has since been 'adjusted,' Harriman said, to avoid associating cannabis with a particular lifestyle. 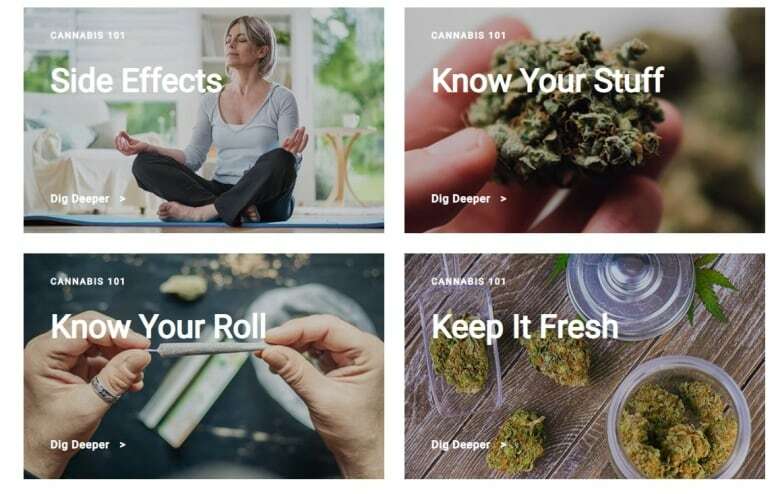 Cannabis NB recently ran afoul of Health Canada's promotional rules by depicting people on its website and associating cannabis with a particular lifestyle. "The law clearly prohibits promotions that associate cannabis with a particular way of life such as glamour, recreation, excitement or vitality," Thierry Bélair, a spokesperson for the federal Health Department, said in an email. Harriman said the decision to change the website was a voluntary one. "It wasn't like we had broken any laws or been directly mandated to change," he said, "but in the partnership with [Health Canada] we decided to evolve." The other key to shrinking the illegal market, Harriman said, is a first-rate shopping experience and product selection that offsets the higher price. "Price is a key factor," Harriman said. 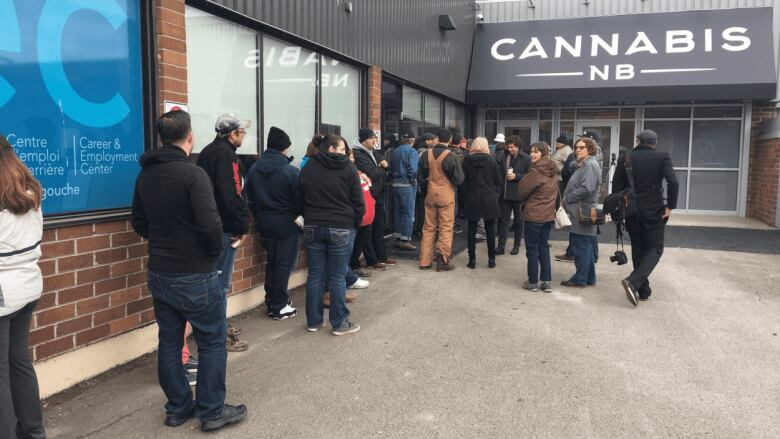 "But ... the feedback we had was that New Brunswickers wanted a chance to buy legal cannabis, they wanted it safe and controlled, they wanted it regulated, and they wanted it in a nice environment." But some locations continue to run low on certain products strains — and others, like the Cannabis NB location in Campbellton — have had to temporarily close in order to restock. Of the approximately 107 companies currently licensed to grow cannabis in Canada, Harriman said, only 34 have the secondary licensing required to sell it. That some producers weren't licensed in time, combined with other factors, meant that Cannabis NB received only "20 per cent of our opening orders," Harriman said. In addition to the licensing issue "some have lost crops … some have had trouble with packaging equipment, others have had trouble with excise stamps." It was fortunate, he said, that the initial orders had "anticipated large demand … otherwise we would have been in a much tougher spot." In the coming weeks and months, Harriman said, Cannabis NB will continue to "evolve." "It's a brand new business," Harriman said. "The shoppers will vote with their feet."